On a March Saturday of raw winds and below-freezing temperatures, Dennis Dapuzzo loads cases of low-fat yogurt, whole-grain Honey Scooters cereal and juice boxes that are high in calcium and vitamin C into his recycled hotdog truck. The cold makes its way inside the truck, which helps keep the juice boxes cool but forces Dapuzzo to keep his jacket on as he drives toward a food pantry in Brentwood. He knows that as bad as the weather can be, Long Islanders are still depending on him to deliver food. Dapuzzo arrives near the intersection of Caleb’s Path and Joshuas Path at a small food pantry a little before 9:30 a.m. People immediately recognize the yellow truck with a crocodile caricature on it, and they line up with their heavy winter jackets to get breakfast for the weekend. “You know that the people who come out on cold mornings like this are the people that need it the most,” said Dapuzzo, who runs Long Island Cares’ Mobile Breakfast Food Truck, which provides weekend breakfasts for children and parents in Brentwood and Bellport. Dapuzzo is not the only one providing nutritious meals to aid Long Island’s hungry on this particular Saturday. 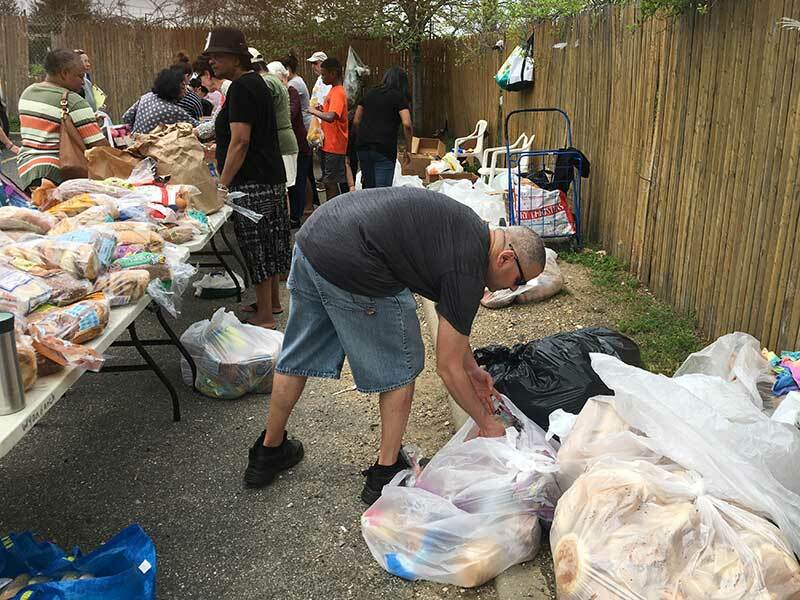 Community Solidarity, a food pantry program where volunteers congregate and distribute food at parking lots and train stations, is also busy handing out whole-grain bread and organic fruits and vegetables in Wyandanch. By targeting these areas with proper nutritional meals, Community Solidarity and the Mobile Breakfast Food Truck are providing a new type of aid that focuses on direct aid and quality rather than just quantity. 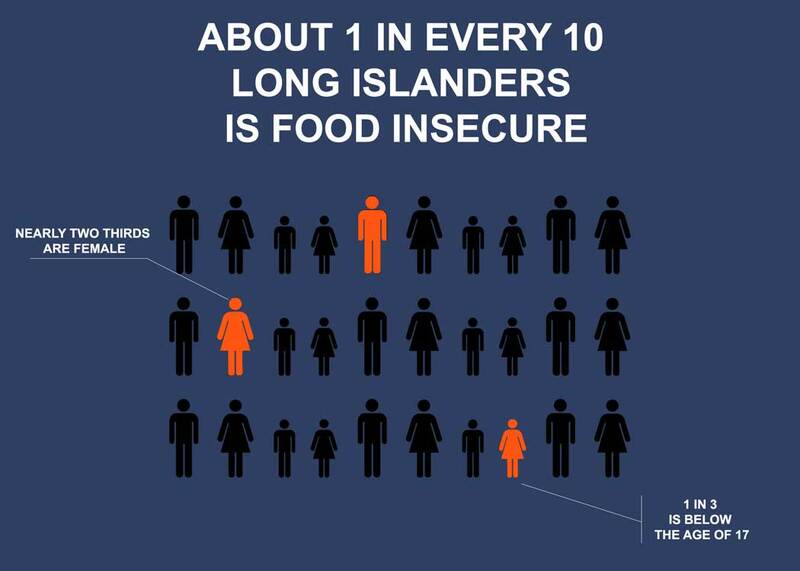 More than one in 10 people on Long Island struggle with food insecurity, which the United States Department of Agriculture defines as the lack of consistent, dependable access to enough food for all the household members to have active, healthy lives. And while there are over 400 food pantries and soup kitchens scattered throughout Long Island, there are still more than 25 areas that the USDA classifies as food deserts, places where residents can’t easily get nutritious, affordable food. The places in Brentwood, Bellport and Wyandanch that receive aid from The Mobile Breakfast Food Truck and Community Solidarity are all considered food deserts by the USDA. The residents there have a hard time getting healthy and affordable food, which is why they need help in the form of direct delivery. In a report by Adelphi University and Sustainable Long Island—a nonprofit organization that advocates the economic development, environmental health and social equity for all Long Islanders—proponents of the food-desert model maintain that the absence of retailers providing inexpensive, healthful food puts residents at risk for poor diets and health conditions. “We’ve known for years that people in food deserts are at an increased risk for chronic conditions like diabetes and heart disease,” says Kathleen Emmett, a nutritionist with Island Harvest, one of the largest food banks on Long Island. Take, for example, the corner of Long Island Avenue and Straight Path in Wyandanch, a food desert area. You can spot a fried chicken place easily, but the nearest store with an affordable produce department is the King Kullen in North Babylon, two miles away. Because there are no bus routes available from this food desert to King Kullen, low-income residents are practically stranded and left to choose less nutritious alternatives. Randi Shubin-Dresner, the president and CEO of Island Harvest, explains that people are feeding their kids fast food because it really is the only affordable food around. “And while it may not be the healthiest food you could get them, many people feel that at least they’re feeding their children and giving them something,” Shubin-Dresner said. To combat this issue, Community Solidarity and Long Island Care’s Mobile Breakfast Food Truck go directly into the food deserts to distribute nutritious meals to the food insecure. When PJ Sangiuolo lost his job three years ago, he found himself struggling to make ends meet. Buying food became difficult. Losing a job suddenly is a typical start to food insecurity. Shubin-Dresner says that when people lose their primary source of income, they start making tradeoffs, choosing between spending their money on food or on things like transportation and medicine. So a friend pointed Sangiuolo towards a group that she herself had gone to for help, Community Solidarity, the largest vegetarian hunger-relief program in the U.S. The group rescues food from supermarkets, farms and donors—food that would have otherwise been thrown away—and distributes it among four food-share locations on Long Island and one in Brooklyn. Community Solidarity President and CEO Jon Stepanian said he helped start the organization in 2005 after he and a couple of friends noticed their local Trader Joe’s was throwing out extra bread. Stepanian and his friends offered to take the leftovers and brought them to a local soup kitchen. “It started with something as simple as that, and it took off,” Stepanian said. Now Community Solidarity has partnered with about 300 supermarkets to pick up their leftover and overstocked food and distributes more than 5,000 pounds of food a week throughout Long Island. Because of its vegetarian philosophy, Community Solidarity collects organic, nutritious and healthy foods while avoiding sugary and fatty foods as well as genetically modified foods. This sets the group apart from other hunger-relief programs, especially food pantries, which, according to Adelphi University’s Food Inequality Report, can offer disappointing products that are highly processed and have low nutritional value. One of the people surveyed in the report expressed frustrations over the lack of options at a local food pantry. The lack of meat never bothered Sangiuolo when he stood in line three years ago to pick up food during the distribution event in Huntington Station. Volunteers distributing food in Community Solidarity’s Wyandanch location. Even though he’s now employed again, volunteering has become a permanent part of Sangiuolo’s Saturdays. Each week, he picks up whole-wheat bread from Villabella Bakery in West Babylon to distribute at Community Solidarity’s Wyandanch location, a parking lot behind the Martin Luther King Jr. Health Center. Here he works with eight other volunteers, organized by Maria Badagliacca, setting up tables filled with a variety of fruits, vegetables and whole-grain products. This week, apples, bananas, grapes and oranges are laid in neat piles at the center of the table. The bread, whole-grain muffins and cookies are put at the far right, and the line ends with a couple of low-fat dairy products for calcium and vitamin D.
Badagliacca picks up a lot of the food from the Trader Joe’s in Commack every Friday and Saturday night for the food distributions in Wyandanch and Hempstead, respectively. About 40 people show up to meet Badagliacca’s team on a typical winter Saturday. But on this especially cold day, only 18 people came. Team members immediately recognized a few individuals, but, they said, the newcomers are likely people who must need the food the most in this USDA-classified food desert. The majority of the people who came out here today are older, some with greying hair and deep wrinkles on their faces and hands. They all wear heavy coats to shield them from the wind and carry a variety of bags to carry their food. Some bring a couple of large tote bags. Others bring half a dozen plastic bags. And a few bring a big, black bag to hold everything. After the people fill their bags and empty the tables of food, Badagliacca’s team packs up and stuffs the empty boxes into her car as they say goodbye. Another successful Saturday has gone by for Community Solidarity in Wyandanch, but there’s another hunger-relief organization that has its eye on this food desert. 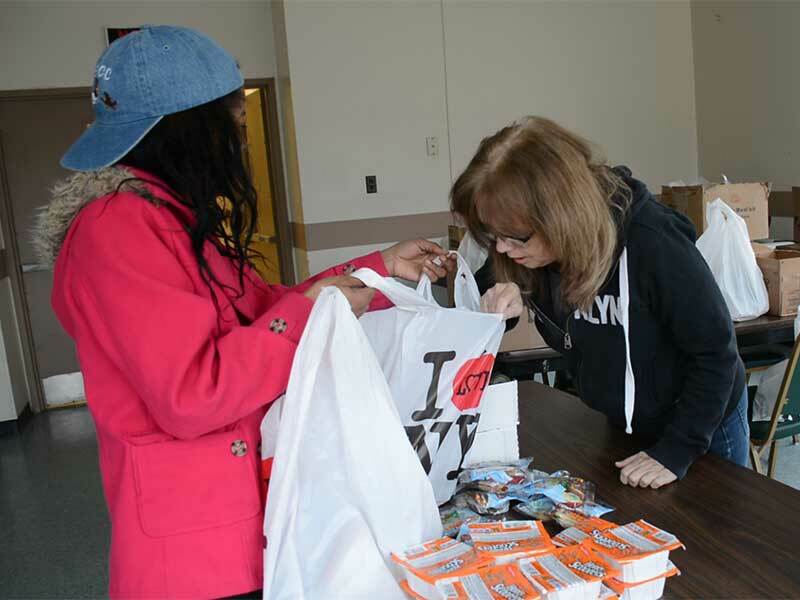 Long Island Cares, another of the island’s largest food banks and hunger assistance organizations, wants to expand its mobile program to include regular visits to Wyandanch to serve complete and nutritious breakfasts to children and parents. In the summer of 2015, LI Cares launched its innovative Mobile Breakfast Food Truck program. 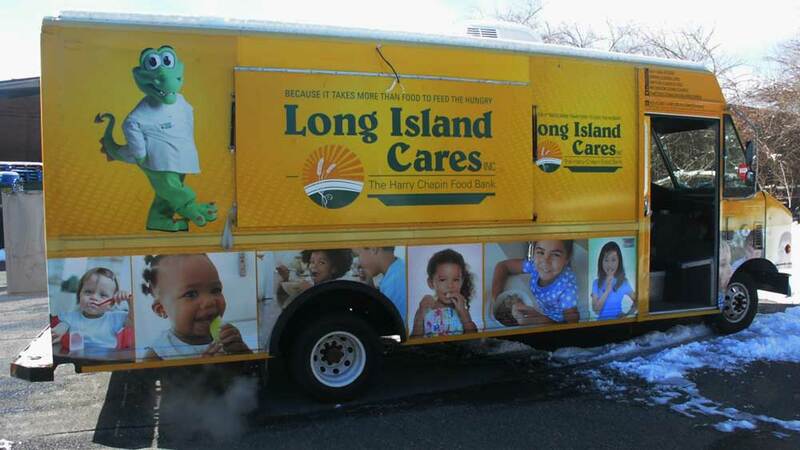 By refurbishing an old, donated food truck—and adding images of a cartoon crocodile and children on all sides—LI Cares pushed a first-of-its-kind program among the nation’s food banks that would deliver nutritious weekend breakfasts to children in food deserts. Every weekend at about 8 a.m., Dapuzzo heads into Long Island Cares’ warehouse to pick out the food that will go into the breakfast bags and packs them into the back of the truck. He makes appointments beforehand at shelters and food pantries, but his usual spots to distribute are in Bellport and Brentwood. There he meets up with a team of volunteers who help him put the food in individual bags for the parents and children waiting in line. The packs consist of whole-grain cereal with natural flavors, low-fat milk, fresh juices rich in vitamin C, high-fiber Belvita breakfast bars, sliced fruits and low-fat yogurt cups. Sometimes they pack low-fat Go-gurt tubes since it’s popular among the children. The cereal gets packed last so that the kids can choose which type of cereal they want. In addition to being nutritious, Dapuzzo said, the food is also shelf-stable. Although they usually distribute about 120 bags each at Bellport and Brentwood, they’ll see fewer people come out on days when it’s below freezing. On those days, Dapuzzo leaves behind the remaining packs at the shelter or pantry he was visiting for anyone who was late or might stop by later. The Mobile Breakfast Food Truck has been quite successful. It’s helped more than 9,000 people within a year and a half, beating out its goal of 7,000. The program received a $200,000 grant late last year from Capital One, and it’s been able to purchase another food truck for additional visits to Amityville, Shirley and Riverhead. Dapuzzo is planning to expand visits not only to Wyandanch but also to Hempstead and Westbury, areas hit hard by food insecurity. Shubin-Dresner’s organization, Island Harvest, has a similar program, one that gives away weekend lunch packs to kids in school. Nutrition is a challenge for these programs, she said, leading hers to depend more on funding from charities, businesses and individuals rather than donations of food. This way, staff members can purchase the food they know the community needs. Dennis Dapuzzo loading the food truck outside LI Cares’ headquaters in Hauppauge. But while these groups are trying new tactics to bring aid to the food deserts on Long Island, it always seems like there’s never enough food for the food insecure. In Wyandanch, a man arrives shortly after Community Solidarity’s food distribution event. He can’t speak English well, but he manages to ask if there’s any food left. Badagliacca knows that the only things left are a few meat products that she’s supposed to deliver to a food pantry later on. She knows that Community Solidarity is a vegetarian hunger-relief organization that doesn’t give out meat at its distribution events. But she can’t leave the man without any food, so she turns a blind eye and gives him a couple of packs of chicken breasts as she keeps telling him that she shouldn’t be doing this. And after he thanks her in both English and Spanish, she reminds him that she will be back next week at noon.